Winter Wonderland will be open on 22nd November 2018 from 4-10pm for a special public preview and then from 23rd November 2018 until 6th January 2019 they will be open every day from 10am – 10pm, except Christmas Day. It’s not just Santa that needs a rest on Christmas Day! For over 10 years, Hyde Park’s Winter Wonderland has been spreading the Christmas spirit throughout London. The winter festival has become a landmark event for Londoners and tourists alike. 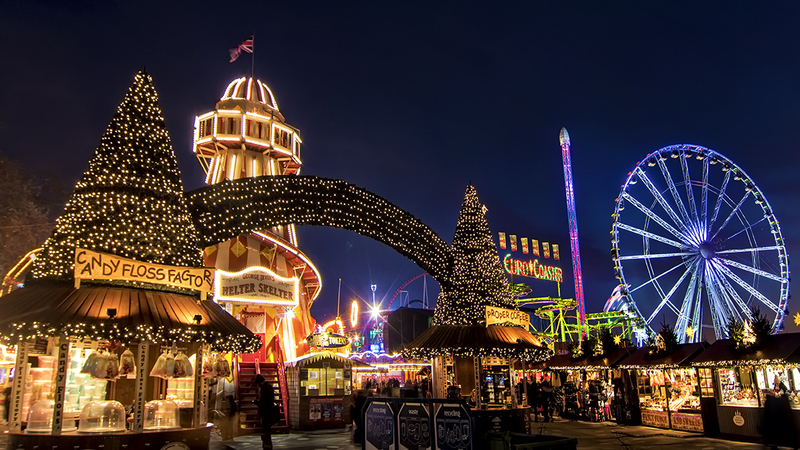 With humble beginnings as an open-air Christmas market in Hyde Park, Winter Wonderland has since grown into an extravaganza with ice skating, shows, roller coaster rides, street food stalls, festive bars and live music. It is still free to enter the Winter Wonderland grounds and take in the joyous atmosphere. With over 100 spectacular rides and attractions, it is no wonder why thousands of visitors return to Winter Wonderland each year to celebrate the Christmas season. Winter Wonderland has got loads in store for you this year and promises to be the best year yet! There are lots of new attractions including Peter Pan on Ice, Teletubbies Christmas Show, Ice Sculpting Workshops, and its very own Comedy Club but let’s not forget the returning favourites, including an even bigger ice rink, jaw dropping acts in the Circus MegaDome and so much more. With FREE entry to Hyde Park Winter Wonderland, go and immerse yourself in the most magical festive spectacular in London. There are a number of attractions that can be pre-booked to avoid disappointment on the day.